For other uses, see Ascanius (disambiguation). "Julus" redirects here. For the millipede genus, see Julus (genus). Ascanius (/əˈskeɪniəs/; Ancient Greek: Ἀσκάνιος) (said to have reigned 1176-1138 BC) a legendary king of Alba Longa and is the son of the Trojan hero Aeneas and either Creusa, daughter of Priam, or Lavinia, daughter of Latinus. He is a character in Roman mythology, and has a divine lineage, being the son of Aeneas, who is the son of the goddess Venus and the hero Anchises, a relative of the king Priam; thus Ascanius has divine ascendents by both parents, being descendants of god Jupiter and Dardanus. He is also an ancestor of Romulus, Remus and the Gens Julia. Together with his father, he is a major character in Virgil's Aeneid, and he is depicted as one of the founders of the Roman race. In Greek and Roman mythology, Ascanius was the son of the Trojan prince Aeneas and Creusa, daughter of Priam. 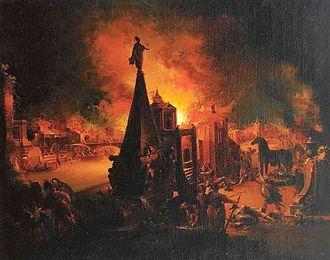 After the Trojan War, as the city burned, Aeneas escaped to Latium in Italy, taking his father Anchises and his child Ascanius with him, though Creusa died during the escape. According to Dionysius of Halicarnassus, Ascanius' original name was Euryleon and this name was changed to Ascanius after his flight from Troy. According to Virgil, Ascanius was also called Iulus or Julus. The Gens Julia, or the Julians, the clan to which Julius Caesar belonged, claimed to have been descended from Ascanius/Iulus, his father Aeneas, and, ultimately, the goddess Venus, the mother of Aeneas in myth, his father being the mortal Anchises. 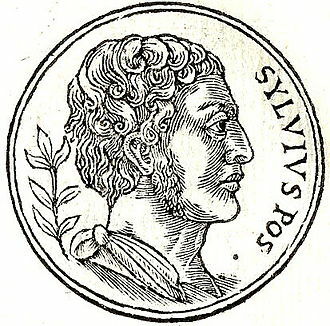 According to Dionysius of Halicarnassus, however, Julus was a son of Ascanius who disputed the succession of the kingdom of Alba Longa with Silvius, upon the death of Ascanius. According to another legend mentioned by Livy, Ascanius may have been the son of Aeneas and Lavinia and thus born in Latium, not Troy. Ascanius later fought in the Italian Wars along with his father Aeneas. 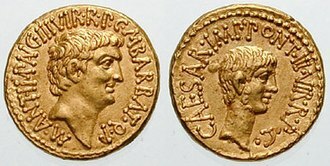 After the death of Aeneas, Ascanius became king of Lavinium and an Etruscan king named Mezentius took advantage of the occasion to besiege the city. Mezentius succeeded in making the city surrender and agree to pay a yearly tribute. Upon his retirement, Ascanius fell upon him and his army unaware and entirely defeated Mezentius and killed his son Lausus. Mezentius was forced to agree to pay a yearly tribute. Subsequent to this, exactly thirty years after the founding of Lavinium, Ascanius founded the city of Alba Longa and became its first king. He left his mother, Lavinia, in charge of the city of Lavinium. Ascanius was succeeded by Silvius, who was either the younger brother of Ascanius or his son. 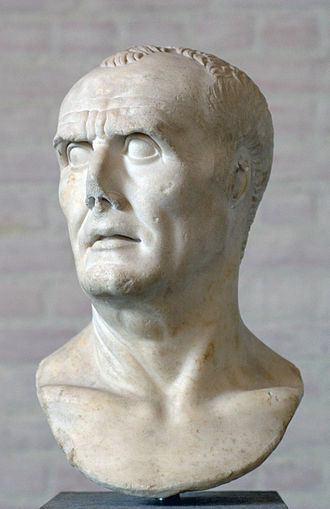 Ascanius died in the 28th year of his reign. However, in the Aeneid, Virgil claims that Mezentius fought in the Italian Wars at the time Aeneas was alive. 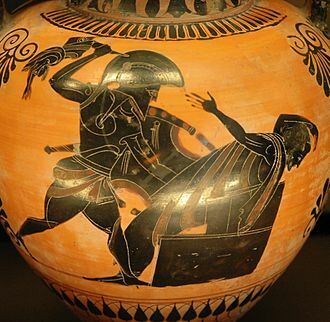 In the Aeneid, it is Aeneas who kills Lausus after harming Mezentius, who escaped while his son faced the Trojan king. When the news about Lausus' death reaches Mezentius, he comes back to face Aeneas, and is killed too. In this account Ascanius does not participate in these deaths. Macte nova virtute, puer: sic itur ad astra, dis genite et geniture deos. This phrase can be translated into English as: "Go forth with new value, boy: thus is the path to the stars; son of gods that will have gods as sons." or "Blessings on your fresh courage, boy, scion of gods and ancestor of gods yet to be, so it is man rises to the stars." In this verse, Virgil makes a clear reference to the offspring of Iulus, from whom Augustus Caesar claimed descent. Therefore, in this verse Virgil refers to the Gens Julia, the family of Augustus and Julius Caesar, who was deified after his death. 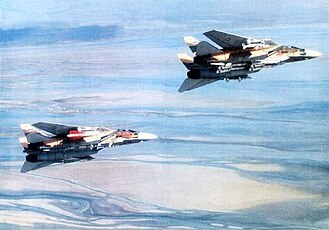 The sic itur ad astra become almost proverbial and several mottos use an ad astra phrase. After this episode, Apollo orders to the Trojans to keep Ascanius away from the war. The translation is : "Omnipotent Jupiter, please favour my audacity" or "All-powerful Jupiter, assent to my bold attempt". The last part of the hexameter became the United States motto annuit coeptis. 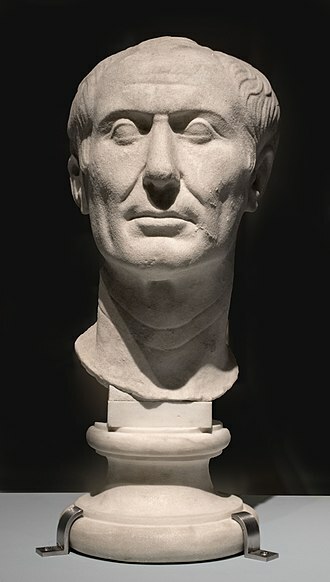 The name Iulus was popularised by Virgil in the Aeneid: replacing the Greek name Ascanius with Iulus linked the Julian family of Rome to earlier mythology. 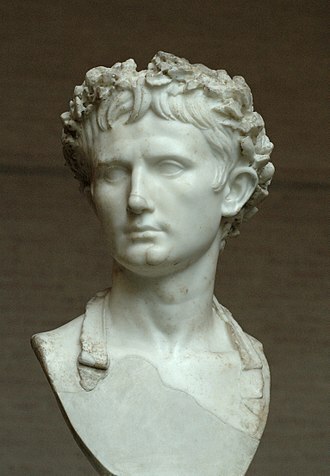 The emperor Augustus, who commissioned the work, was a great patron of the arts. As a member of the Julian family, he could claim to have four major Olympian gods in his family tree: (Jupiter, Juno, Venus and Mars), so he encouraged his many poets to emphasize his supposed descent from Aeneas. 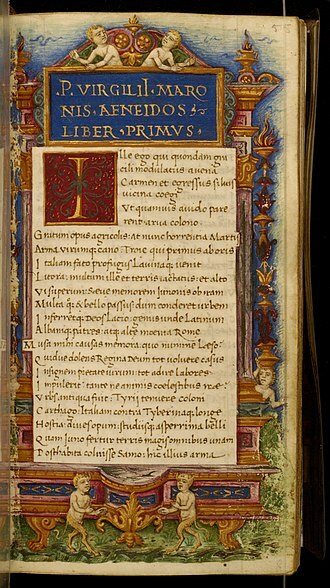 Livy, Ab urbe condita Book 1. Wikimedia Commons has media related to Ascanius. Alba Longa was an ancient city of Latium in central Italy,19 kilometres southeast of Rome, in the Alban Hills. Founder and head of the Latin League, it was destroyed by Rome around the middle of the 7th century BC. 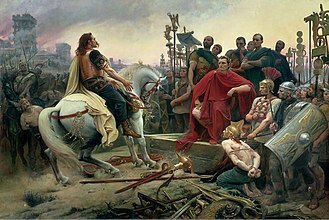 In legend and Remus, founders of Rome, had come from the dynasty of Alba Longa, which in Virgils Aeneid had been the bloodline of Aeneas. 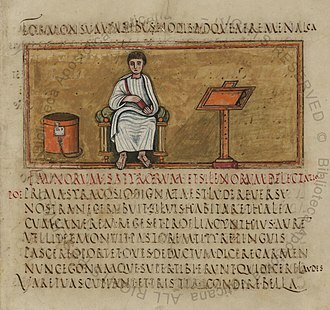 Livy said of Alba Longa that it was founded by Ascanius to relieve crowding at Lavinium and he placed it at the foot of the Alban Mount and said that it took its name from being extended along a ridge. Dionysius of Halicarnassus repeated the story, but added that Ascanius, following a given to his father. Noting that alba means white he translated the name into Greek as long white town, Dionysius placed the town between the Alban Mount and the Alban Lake, thus beginning a long controversy about its location. Since the 16th century, the site has been at times identified as that of the Convent of St. Paul at Palazzola near Albano, Coste Caselle near Marino. The last named of these places in fact occupies the site of Domitians villa which, archaeological data show the existence of a string of villages in the Iron Age, each with its own necropolis, along the south-western shore of Lake Albano. In the period the territory of Alba was settled once again with many residential villas. According to Roman legend, after the fall of Troy in 1184 BC, Aeneas led a group of surviving Trojans through the Mediterranean to Sicily, upon landing in Italy he was welcomed by Latinus, king of the early Latins. Soon, Aeneas married king Latinus daughter and would found the city Lavinium in her name, Latinus fell in war making Aeneas king and his son, his successor. A few years Aeneas was killed in battle like Latinus, Ascanius reportedly built Alba Longa at the slope of Mount Alba with six hundred families as a colony of Lavinium. The city was founded thirty years after Lavinium and his descendants would rule the Latins for another five hundred years. Alba Longa was the city of the roughly thirty cities that made up the Latin League. 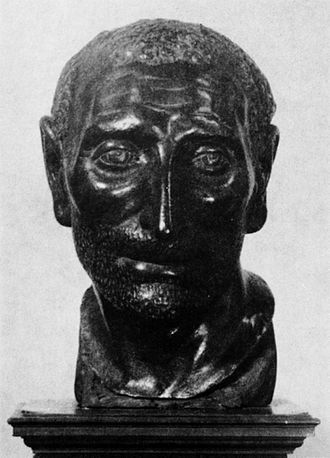 In Roman mythology, Mezentius was an Etruscan king, and father of Lausus. Sent into exile because of his cruelty, he moved to Latium and he reveled in bloodshed and was overwhelmingly savage on the battlefield, but more significantly to a Roman audience he was a contemptor divum, a despiser of the gods. He appears in Virgils Aeneid, primarily book ten, where he aids Turnus in a war against Aeneas, while in battle with Aeneas, he is critically injured by a spear blow, but his son Lausus bravely blocks Aeneass final blow. Lausus is killed by Aeneas, and Mezentius is able to escape death for a short while, once he hears of Lausus death, he feels ashamed that his son died in his place and returns to battle on his horse Rhaebus in order to avenge him. He is able to keep Aeneas on the defensive for some time by riding around Aeneas, Aeneas kills the horse with a spear and pins Mezentius underneath. 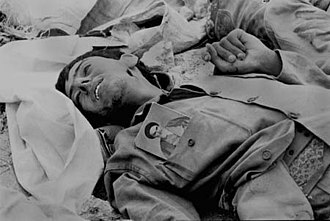 He is overcome by Aeneas, but remains defiant and fearless unto his death, not begging for mercy as Turnus does, but simply asking that he be buried with his son. Latium is the region of central western Italy in which the city of Rome was founded and grew to be the capital city of the Roman Empire. Latium was originally a triangle of fertile, volcanic soil on which resided the tribe of the Latins or Latians. 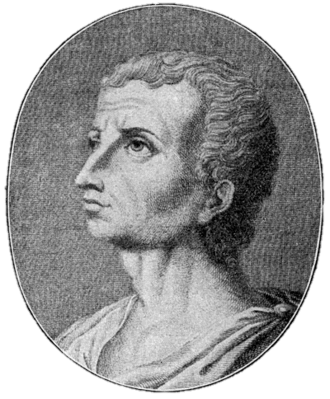 It was located on the bank of the Tiber river, extending northward to the Anio river. The right bank of the Tiber was occupied by the Etruscan city of Veii, Rome defeated Veii and its Italic neighbors, expanding Latium to the Apennine Mountains in the northeast and to the opposite end of the marsh in the southeast. The modern descendant, the Italian Regione of Lazio, called Latium in Latin, and occasionally in modern English, is larger still. 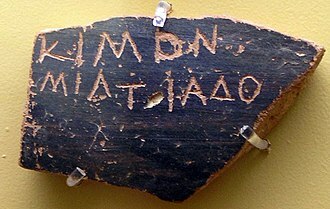 The ancient language of the Latins, the tribesmen who occupied Latium, was to become the predecessor of the Old Latin language, ancestor of Latin. Latium has played an important role in history owing to its status as the host of the city of Rome. Consequently, Latium is home to celebrated works of art and architecture, in its center is a crater lake, Lacus Albanus, oval in shape, a few km long and wide. The last pagan temple to be built stood until the Middle Ages when its stone and location were reused for various monasteries and finally a hotel. 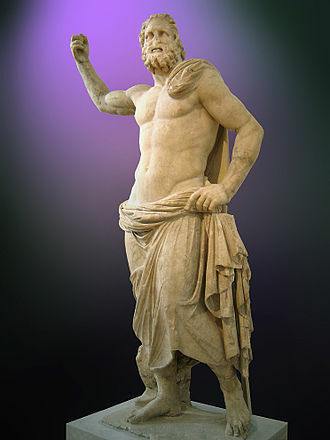 The selection of Jupiter as a god and the descent of the name Latini to the name of the Latin language are sufficient to identify the Latins as a tribe of Indo-European descent. Virgil, a poet of the early Roman Empire, under Augustus, derived Latium from the word for hidden because in a myth Saturn, ruler of the golden age in Latium. A major modern etymology is that Lazio comes from the Latin word latus, meaning wide, the region that would become Latium had been home to settled agricultural populations since the early Bronze Age and was known to the Ancient Greeks and even earlier to the Mycenaean Greeks. The name is most likely derived from the Latin word latus, meaning wide, expressing the idea of land but the name may originate from an earlier. 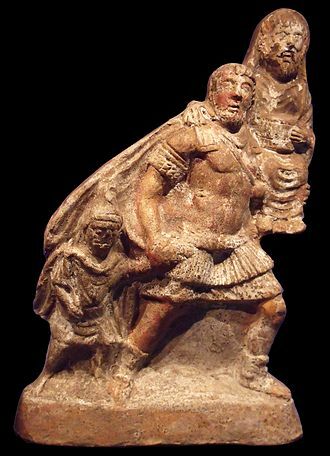 The Etruscans, from their region of Etruria exerted a strong cultural and political influence on Latium from about the 8th century BC onward. Juno is an ancient Roman goddess, the protector and special counselor of the state. She is a daughter of Saturn and sister of the chief god Jupiter, Juno looked after the women of Rome. 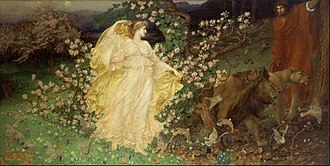 As the patron goddess of Rome and the Roman Empire, Juno was called Regina and, together with Jupiter, Junos own warlike aspect among the Romans is apparent in her attire. She often appeared sitting pictured with an armed and wearing a goatskin cloak. The traditional depiction of this aspect was assimilated from the Greek goddess Athena. The name Juno was thought to be connected to Iove, originally as Diuno. At the beginning of the 20th century, a derivation was proposed from iuven- and this etymology became widely accepted after it was endorsed by Georg Wissowa. Iuuen- is related to Latin aevum and Greek aion through a common Indo-European root referring to a concept of energy or fertile time. The iuvenis is he who has the fullness of vital force, in some inscriptions Jupiter himself is called Iuuntus, and one of the epithets of Jupiter is Ioviste, a superlative form of iuuen- meaning the youngest. Iuventas, was one of two deities who refused to leave the Capitol when the building of the new Temple of Capitoline Jove required the exauguration of deities who already occupied the site, Juno is the equivalent to Hera, the Greek goddess for love and marriage. 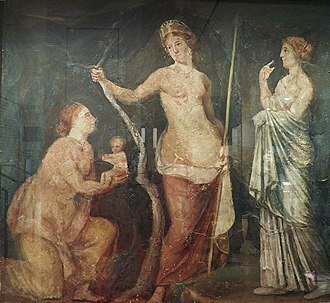 Juno is the Roman goddess of love and marriage, Junos theology is one of the most complex and disputed issues in Roman religion. Even more than other major Roman deities, Juno held a number of significant and diverse epithets and titles representing various aspects. In accordance with her role as a goddess of marriage. However, other epithets of Juno have wider implications and are thematically linked. 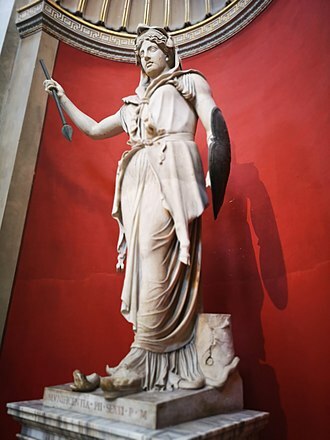 Juno is certainly the divine protectress of the community, who shows both a sovereign and a fertility character, often associated with a military one and she is attested at Praeneste, Ardea, Gabii. In five Latin towns a month was named after Juno, outside Latium in Campania at Teanum she was Populona, in Umbria at Pisaurum Lucina, at Terventum in Samnium Regina, at Pisarum Regina Matrona, at Aesernia in Samnium Regina Populona. In Roman mythology and Remus are twin brothers, whose story tells the events that led to the founding of the city of Rome and the Roman Kingdom by Romulus. 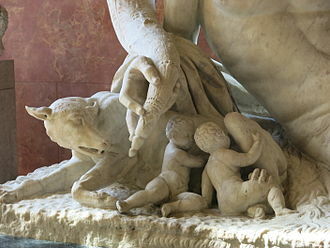 The killing of Remus by his brother, and other tales from their story, have inspired artists throughout the ages, since ancient times, the image of the twins being suckled by a she-wolf has been a symbol of the city of Rome and the Roman people. 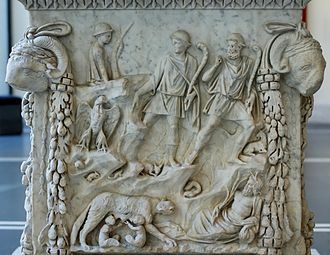 Although the tale takes place before the founding of Rome around 750 BC, whether the twins myth was an original part of Roman myth or a development is a subject of ongoing debate. 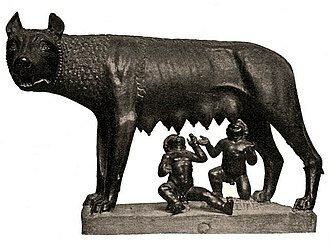 Romulus and Remus were born in Alba Longa, one of the ancient Latin cities near the site of Rome. Their mother, Rhea Silvia was a virgin and the daughter of the former king, Numitor. In some sources, Rhea Silvia conceived them when their father, through their mother, the twins were descended from Greek and Latin nobility. Seeing them as a threat to his rule, King Amulius ordered them to be killed. 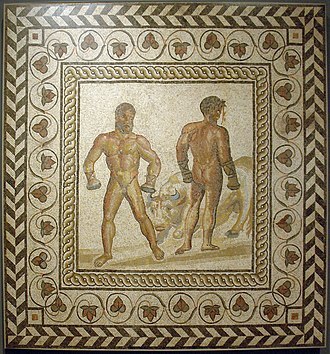 They were saved by the god Tiberinus, Father of the River and survived with the care of others, in the most well-known episode, the twins were suckled by a she-wolf, in a cave now known as the Lupercal. Eventually, they were adopted by Faustulus, a shepherd and they grew up tending flocks, unaware of their true identities. Over time, their leadership abilities attracted a company of supporters from the community. 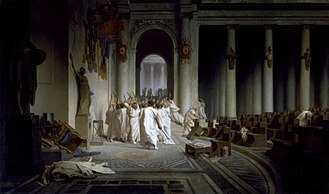 When they were adults, they became involved in a dispute between supporters of Numitor and Amulius. As a result, Remus was taken prisoner and brought to Alba Longa, both his grandfather and the king suspected his true identity. Romulus, had organized an effort to free his brother, during this time they learned of their past and joined forces with their grandfather to restore him to the throne. Amulius was killed and Numitor was reinstated as king of Alba, the twins set out to build a city of their own. After arriving back in the area of the seven hills, they disagreed about the hill upon which to build, Romulus preferred the Palatine Hill, above the Lupercal, Remus preferred the Aventine Hill. When they could not resolve the dispute, they agreed to seek the gods approval through a contest of augury, Remus first saw 6 auspicious birds but soon afterward, Romulus saw 12, and claimed to have won divine approval. 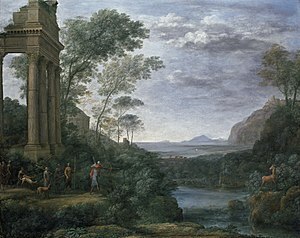 Claude Lorrain was a French painter and engraver of the Baroque era. He spent most of his life in Italy, and is one of the earliest important artists, apart from his contemporaries in Dutch Golden Age painting, to concentrate on landscape painting. His landscapes are usually turned into the more prestigious genre of paintings by the addition of a few small figures. By the end of the 1630s he was established as the leading landscapist in Italy and these gradually became larger, but with fewer figures, more carefully painted, and produced at a lower rate. He was not generally an innovator in painting, except in introducing the sun into many paintings. His patrons were mostly Italian, but after his death he became popular with English collectors. He was a creator of drawings in pen and very often monochrome watercolour wash, usually brown. 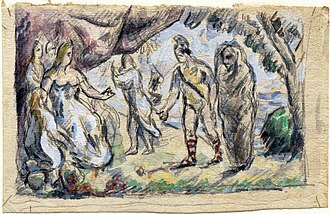 Chalk is sometimes used for under-drawing, and white highlighting in various media may be employed and these fall into three fairly distinct groups. Firstly there are numbers of sketches, mostly of landscapes, and apparently very often done at the scene, these have been greatly admired. 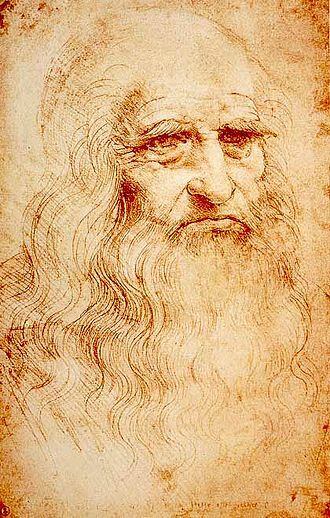 Then there are studies for paintings, of various degrees of finish, many clearly done before or during the process of painting and this was certainly the case for the last group, the 195 drawings recording finished paintings collected in his Liber Veritatis. He produced over 40 etchings, often simplified versions of paintings and these served various purposes for him, but are now regarded as much less important than his drawings. He painted frescoes in his career, which played an important part in making his reputation. The earliest biographies of Claude are in Joachim von Sandrarts Teutsche Academie, both Sandrart and Baldinucci knew the painter personally, but at periods some 50 years apart, respectively at the start of his career and shortly before his death. Sandrart knew him well and lived with him for a while, while Baldinucci was probably not intimate with him, and derived much of his information from Claudes nephew, who lived with the artist. Claudes tombstone gives 1600 as his year of birth, but contemporary sources indicate a date and he was born in the small village of Chamagne, part of the Duchy of Lorraine. Detail of the U.S. one-dollar bill. Aeneas Bearing Anchises from Troy, by Carle van Loo, 1729 (Louvre). Aeneas defeats Turnus, Luca Giordano, 1634–1705. 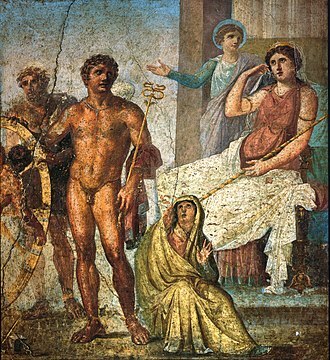 The female on the left is Venus, Aeneas' mother, who supported him during the battle. 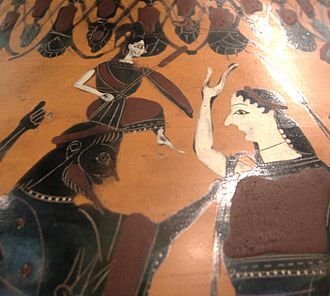 The female on the right must be Turnus' sister, the nymph Juturna, who was forced by a Fury (transformed to a black bird sent by Jupiter) to abandon Turnus to his fate.